Lily of the Village . . .
Churchyards afford quiet green corners in any city. A reflective atmosphere can be found and, if one searches the garden edges, so can wildflowers, decorative motifs not unlike the colorful illustrations rendered on the margins of illuminated manuscripts. This past Sunday my wife and I enjoyed a mellow brunch and extended that mood with a stroll around the grounds of a nearby church. We found an open bench beneath a crab apple tree full of fruit. Sparrows visited us as we chatted in the dappled shade. Butterflies and honeybees buzzed by, too. A kind of city traffic humming with a much more relaxed timbre. When we stood up to return home, I noticed a tiny patch of color nestled within the undergrowth shaded by the surrounding red brick walls. What I saw up close affected me as much as the first flowers of spring. There, within the thinning, fading green of autumn stood a single, distinctive bloom. The flower resembled an orchid in some respects. The six pale cream tepals were sharply pointed and displayed a vibrant purple leopard print. An exaggerated pistil resembling a tropical sea anemone was likewise spotted. The leaves below were alternate, perfoliate, lanceolate, and somewhat smooth. The entire plant stood less than a foot in height. There were no other examples but this one to be seen in the garden, which left the impression I had found a wild, or at least feral, flower species that bloomed in the fall. Back home, I felt excitement, a visceral enthusiasm that wells up less frequently now after writing about the West Village’s flowering plants for nearly three years. My personal discoveries of new species have steadily become fewer and further in between. What has increased is my knowledge base. I ignored the football and baseball games on television and went to work, cross-referencing details with those found in my ever-growing collection of print and online resources. I used a kind of information triangulation that allowed me, after about an hour, to close in on a specific identification. The flowering plant I found in the churchyard is, in fact, a fall perennial, small in stature, with a richly spotted bloom. An Asian immigrant from Japan, it is not of the orchid tribe but rather a member of the genus Liliaceae. 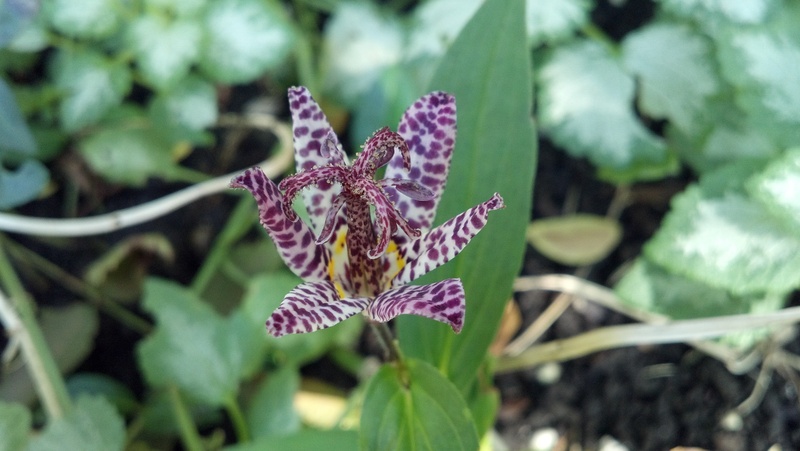 A hardy, shade-loving, herbaceous species that grows well left to its own, the toad lily is so named for the way this flower makes its appearance in the garden. Like a little spotted amphibian sitting beside a mountain stream (the environment where it is found in its native land), this flower does resemble that handsome prince in disguise. Reflecting on this most recent path to discovery, I found another good reason to visit church on Sunday, as well as a reminder to stay alert. You do not know the day or the hour . . . leading to the discovery of another flower! 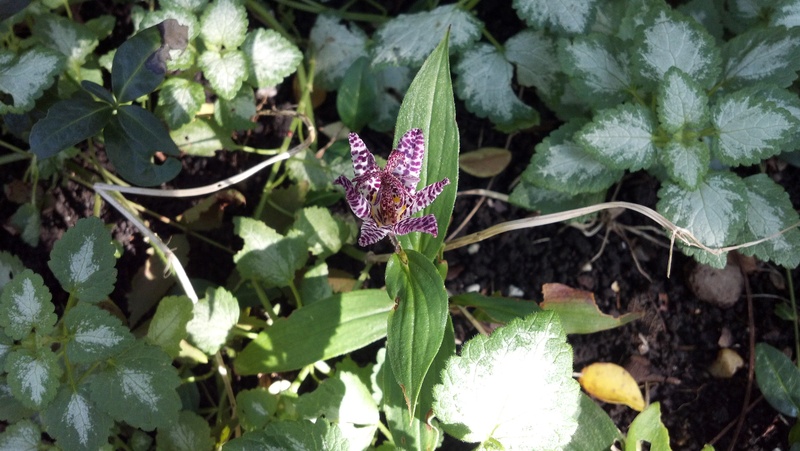 The single toad lily I found growing wild in an otherwise carefully cultivated garden reminded me that wildflowers can be found at almost any time and just about anywhere, even in a city as built up as New York.